2019 has been a rough year for Alabama’s weather. The latest storms occurred Sunday after a possible tornado hit Troy in the early morning hours while residents slept in their beds. Resident James Thamas left his home to seek shelter. He didn’t make it far before having to pull into a near gas station to lay down in his truck. Thamas says he’s not sure if his home survived the storm. Now clean up efforts are underway, with crews working to repair electricity and storm debris. 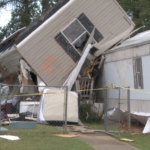 Some of that damage occurred in the Hunter’s Mountain trailer park, where three trailers were flipped over. Resident Rickey Lahey lives in the trailer park. He and his fiancé awoke to the sound of glass shattering. His brother Julian Lahey was visiting from Florida. “Everybody’s kind of like a close-knit family and it’s just tough you know, seeing everybody out here scrambling and messed up, you know. It just kinda happened like that,” Julian says. Residents say their damaged belongings can be replaced, but their lives cannot. Reeves is urging caution as power crews and emergency responders work to repair powerlines and clean up the debris. “It’s important that as we clean up, that people stay off the roads and just protect themselves. Be careful,” Reeves says. Damage has also been reported in the town of Goshen from a possible tornado.